Bánh Mì Comes to Amherst! This Memorial Day weekend coincides with commencement activities at the University of Massachusetts, my alma mater. Not much has changed since the time of my studies there last century. Bars, pubs, and other banal food purveyors continue to dominate Amherst's restaurant scene. How much beer, pizza, and ice cream does the average student require? The recent opening of Miss Saigon, however, changed that somewhat by introducing the Vietnamese bánh mì sandwich to this college town. 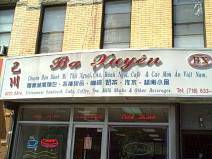 Having been spoiled by the marvelous sandwiches of Sunset Park's Ba Xuyên (as well as those of several others in Brooklyn and Manhattan), I was quite disappointed with the mediocrity of Boston's putative best. Thus, I was highly skeptical of what Amherst's Miss Saigon had to offer. That skepticism was quickly dispelled with the first bite, however. Miss Saigon's version of the bánh mì sandwich is quite tasty. A crusty baguette, pâté schmear, meat, cilantro, julienned carrots and daikon, onions, jalapeños, and sliced cucumber are collated expertly to produce a successful flavor alliance. Eliminating even one of the foregoing ingredients would result in a lesser sandwich. Though the meat choices—classic pork, BBQ beef, and BBQ chicken—seem somewhat limited, they afford a satisfactory variety. Better to have a few good selections than a lot of bad ones. The $3.95 price represents a relative bargain when compared with Quiznos' $4 bomb it calls the Toasty Torpedo (a foot-long breadstick disguised as a sandwich). While a bit pricey at $4.50, the milkshakes are delicious. Their lack of sweetness makes them particularly refreshing compared with the average shake. The durian, with its clean taste, is rapidly becoming a favorite. (In an earlier post, I had described the flavor as a combination of egg salad and papaya.) 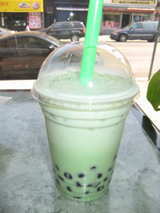 Also available are the increasingly popular pearl boba drinks (bubble tea), priced at $3. 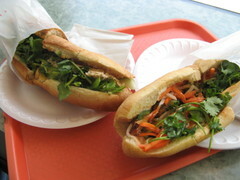 In addition to its bánh mì sandwiches, Miss Saigon offers an extensive selection of Vietnamese dishes. Meals are available in the dining room or for takeout. I found one of my favorite sandwiches at a little Vietnamese shop on the northern fringes of Brooklyn's Asian community in Sunset Park. 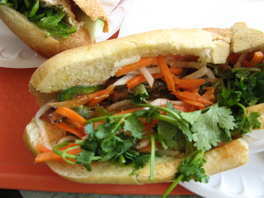 Ba Xuyên's bánh mì (pronounced bung·MEE) convinced me that east had conspired with west to produce a superb sandwich. 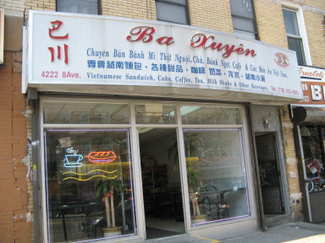 BX offers nearly a dozen bánh mì sandwich selections, roughly half of which contain pork in some form (e.g., shredded, barbequed, even crushed into meatballs). Additional choices include grilled chicken, turkey breast, cá tuna, and, possibly my favorite, cá mòi (sardine). Regardless of the sandwich, I always order it spicy. (Ba Xuyên's red sauce not only adds a moderate amount of heat, but also provides a rich, savory flavor.) While most sandwiches cost $3.50, a few are higher, topping out at $4.25 for the tuna, another favorite. For $2.50, you could try one of Ba Xuyên's unusual fruit shakes. Condensed milk, light cream, fruit, and ice are blended together to produce a refreshing drink that isn’t particularly sweet. Flavors include jackfruit (which the Chinese call sweet pineapple, a close description of the taste), litchi, taro, papaya, and strawberry. Perhaps the most interesting, however is the durian. Owing to its profoundly rank odor, the so-called king of fruit must be sold frozen in the United States and is not permitted aboard many airlines. BX's shake produced therefrom, however, is not nearly so malodorous and is definitely worth a try. I'd describe the flavor as a combination of egg salad and papaya. Although the durian experiment might suggest that your courageous Comestiblogger possesses the temerity to drink almost anything, I've yet to muster the courage to try the avocado shake. As an alternative to a shake, you could try one of the popular "pearl cold drinks," better known as bubble tea. (Pearl, incidentally, refers to the large tapioca beads at the bottom of the drink.) It's clear why the beverages come with such wide straws! 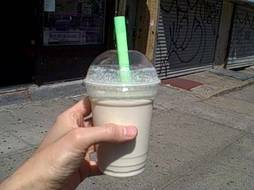 As with their shakes, BX's bubble teas are not sweet. Their creaminess provides a nice counterbalance to the spice of the sandwiches, and the absence of sugar ensures that no cloying aftertaste comes between one’s palate and the enjoyment of the bánh mì. As for as the tapioca pearls, their charm lies in their chewy texture and the palate-cleansing effect they offer with every sip. We found the honeydew melon bubble tea to be as pleasing to the palate as it is to the eye. Other goodies are also available. Among the dessert options, my Comestaccomplice sampled two: a sesame-encrusted ball filled with red bean paste, and an aspic torte which almost defies description, but which is a real winner. The former's sesame coating does not overwhelm the dough and paste flavors. To its enormous credit, the red bean paste filling lacks the waxy mouth-feel common among many other red-bean concoctions. It is very smooth, and just barely sweetened. Now, to describe the “torte,” the name, and, alas, contents of which we could only surmise. (English is not a strong suit at BX.) 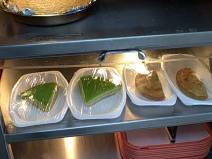 It consists of nine layers: three each of green aspic, purple aspic, and coconut cream. Based on other forays into Vietnamese food, it's possible that the green layer is made from green bean juice, and the purple layer from red bean paste. But at least the coconut is discernible. Once again, the use of sugar is restrained. In its place, a rich and earthy essence of coconut comes through, just sweet enough to enhance the savory flavors of the vegetable-based aspics. Its refreshing, palate-cleansing properties make it a perfect finish to any meal, Vietnamese or otherwise. 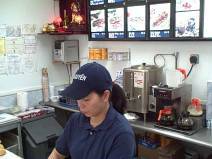 As for price, two sesame rolls and one torte amounted to a whopping $2.80. 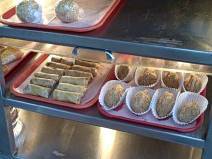 As we waited for our sandwiches to be prepared, we saw quite a few fresh-looking spring rolls sold—mostly containing some rather large shrimp, though a barbequed shredded pork also seemed to be enrolled. I've never been disappointed with anything I've tried here, and clearly the spring rolls are a popular quick-stop pick. Please bear in mind that BX closes at 6:30 P.M. Although dining is limited to four tables, I've always found a seat. On a pleasant day, however, you may opt to enhance your dining pleasure alfresco and enjoy spectacular views afforded by the park for which the neighborhood is named. The entrance to Sunset Park is on Seventh Avenue, one block west.